Discussion in 'Guitars in General' started by friend33, May 8, 2016. John ended up using a later year Ford color to get there. The color is closest to about 25 seconds into the vid, where they are spinning the car and showing the hood. (The shots of the interior are far more strident, not close at all.) Gold grill, chrome trim, the "India Ivory" top are all reflected really well in the hardware/pups/guard. Best yet, the guitar plays like a dream! Everything from clear, introspective stuff to full on rock power! Had it down with the band yesterday, and it killed in every way. These guys are a joy to work with, and these instruments are fantastic! Flatscan, Baemer, Bob Pollock and 14 others like this. I am intrigued by the Ronin designs. Mainly the pickups. 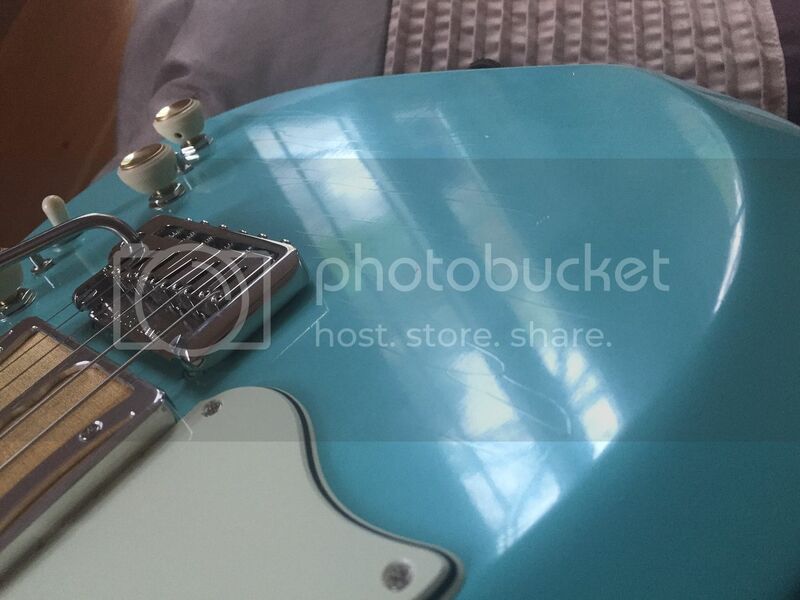 What's the thinking behind the reversed pickguard? These guitars do it for me. I'm going to have to get one. Congrats on your Mirari. Great choice of color! They were developed in conjunction with @splatt . He incorporated the "Tornipulater" circuit, and the guard was designed to cover that. If you look in the Mirari gallery, there is a coral one with an Ivoroid guard and a blue one with a silver guard that have the circuits installed. I think John and Izzy liked the look of that design, and continued to offer it that way. EDIT: The gallery was recently updated, they cleared out a number of older pics to make way for newer guitars they have done. 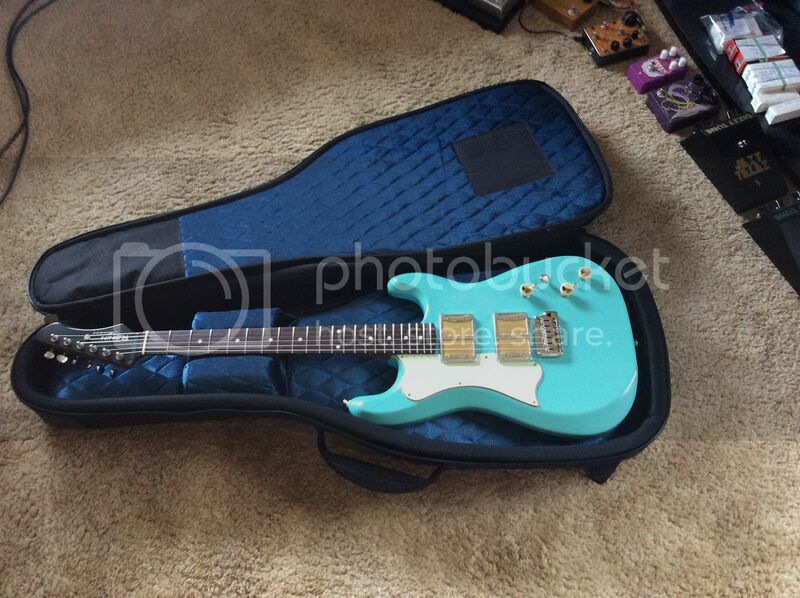 I don't think DT's guitars are pictured there anymore, but he has posted them numerous times on TGP. Flatscan and tonewoody like this. RoninGuitars and Tehillah like this. There's no question, the Ronin boys do great finishes, quality builds, are quality, are creative people that are fun to deal with - but how do these instruments actually play? A: Really, really, really well. One thing I can say, it is a great match for the Kirkland Solstice. I plated the whole session - well, 90% - with this combo. The Mirari has great cleanup capability and superb dynamics. The Solstice has a wide range of capabilities that can exploit all that. Or maybe the Mirari exploits the Solstice? Flatscan and splatt like this. Flatscan and Pizza like this. Great guitar, very cool color! They are really fantastic, though, for reals. I just spent an hour on the neck pickup (sc setting) straight through the amp. Here are a couple of shots to capture the subtle finish checking. Got a bit lucky - this first pic is pretty close to the actual color. (John and I were talking, he said the pastels are notoriously hard to capture without more advanced photo editing tools...) Because the tone of the floor and tile are also slightly off, last pic is actually a good representation as well, in its natural habitat... The mint guard also shows up nicely in that last one. Flatscan, Baemer, Bob Pollock and 4 others like this. I had no idea Costco sold effects pedals! Trevorsnackson, RoninGuitars and friend33 like this. Happy NGD! Love that color! Forgive my ignorance. 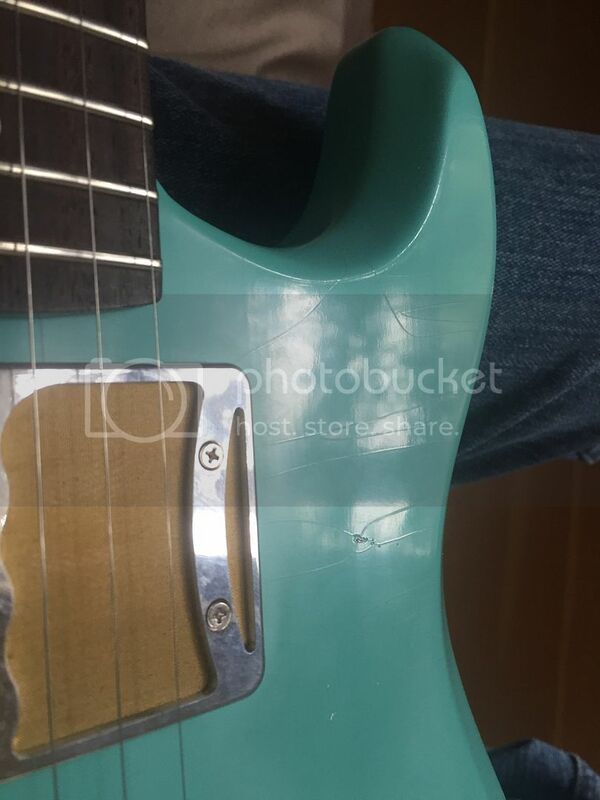 What pickups are those? Ronin makes them for this guitar. They are really terrific, particularly the neck pickup. Yes, as @cbm said, they are proprietary pickups by @RoninGuitars. I believe they started with the old DeArmond-style gold foils as a basis, and then moved well beyond and even into humbuckerland (originals were single-coils). They are individually splittable with the mini pushbutton switches. They also have a single coil design used on some of their other guitars. The new Morningstar has another, newer single coil design as well. I have another guitar with Fralin Big Singles, which are supposed to be very close to the original design/construction. They both have some of that traditional trashy sparkle when dialed/breaking up (technical terms, I know! ) and some string clarity even during maximum hash. The Ronins seem to go further in both aspects - fuller range with more bottom end overall and more heft and texture to the breakup tones. You can get just divine clarity in the clean tones, they have an acoustic-type harmonic complexity that you can really get lost in. Then you crank them up the next minute and - whoa! 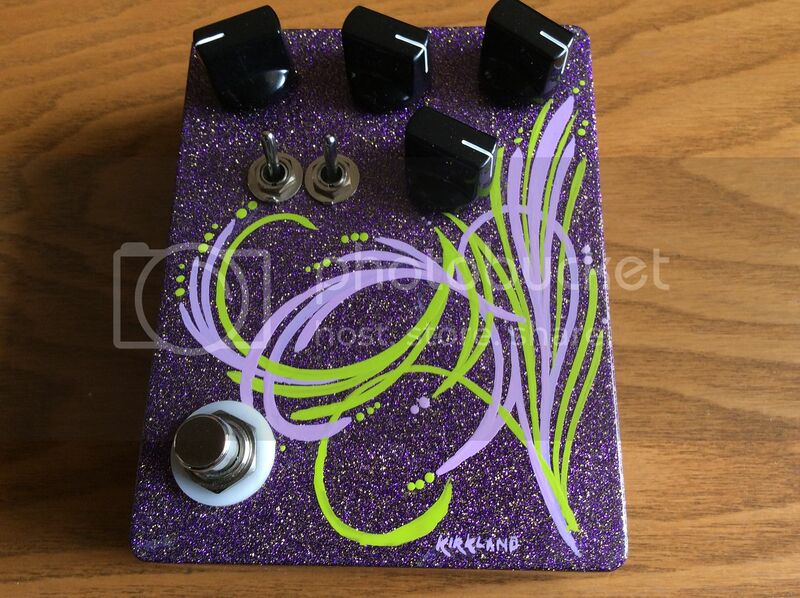 Great with fuzzes, maintain great string separation and detail. The redwood seems to be a supporting factor in achieving this. Highly addictive in every way...(even unplugged )! @friend33 Looks like you to are peas and carrots! 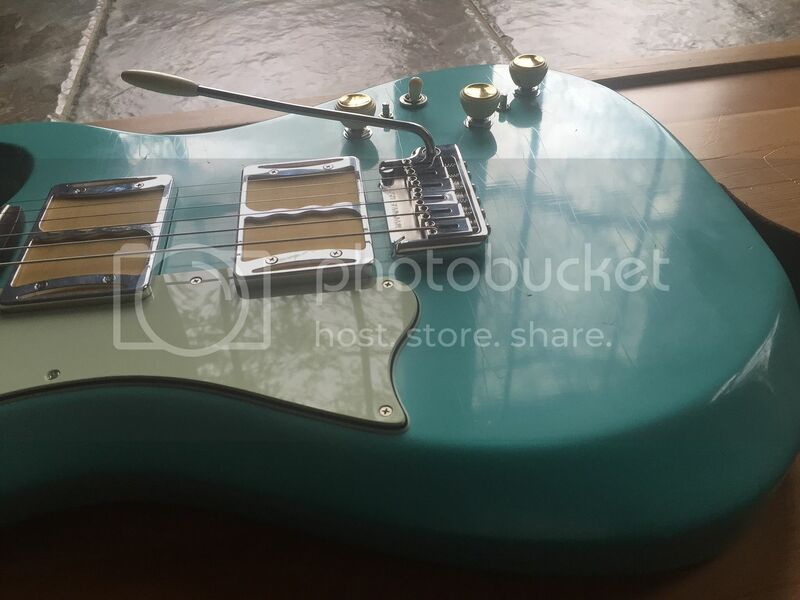 We had the Aztec Turquoise color custom mixed in Nitro (normally only offered in acrylic back in the day) for a Badmoon build and it turned out to be a fantastic color—I prefer it over Sea Foam Green now. Regarding the pick guard placement, it DID start out as a functional housing for DT's Tornipulator but honestly, the moment we finished up Pinky and played the guitar, we knew it would stay right there. The pick guard elevates your hand during certain/many righthand techniques and feels very comfortable. I think only one person ever took it off or didn't want it so I believe the consensus among owners reflects our experience. The Mirari, like all Ronins is designed with dynamics and balance across all things. Specifically, the Foilbucker pickup gives the player a foundation without withholding information. The reclaimed old growth redwood body provides that warm, forgiving "old" sound to the back end of the note, while the Foilbuckers provides the detail and attack—BALANCE. The tone cap/pot is very specifically chosen (we collect NOS tone caps and every one is tested for each guitar, sometimes going through a few to get the exact interaction) to provide serious, usable tone shaping—often times to the end result of a more traditional tone found in Humbuckers, P90's Tele etc etc. By "removing" some of the Foilbucker ethereal character and focusing the midrange, a huge array of other voicing can be achieved, especially if you have the right amp to compliment that "thing" you are going for. Baemer and friend33 like this. The above post is not just words - it's the reality of playing a Ronin. Then there's the endless fun of tweaking that equation with single/hum, bolt-on/set, scale, and body shape.